Clan Des Obeaux wins the King George! In an incident-packed renewal, for a brief moment it looked as if the 2016 winner Thistlecrack was about to roll back the years when he hit the front, but he ultimately had no answer after the last to a rival four years his younger. Harry Cobden – in his first full season as stable jockey to former champion trainer Nicholls – was determined not to hit the front too soon and had the confidence to take a pull alongside Thistlecrack. A fine leap at the last sealed it and while the Colin Tizzard-trained Thistlecrack gamely stuck to his task for Tom Scudamore, he was beaten a length and half by the 12-1 winner, who is part-owned by Sir Alex Ferguson. Tizzard’s Gold Cup winner Native River was under pressure for much of the race and stuck on for third, passing the winner’s stablemate Politologue for minor honours. There had been drama at halfway, when Bristol De Mai fell at the fence in front of the stands, badly hampering Waiting Patiently, who unseated Brian Hughes. Coneygree ran well for a long way, but Might Bite looks a shadow of the horse he was when winning the race 12 months ago. Clan Des Obeaux is now 8-1 for the Gold Cup with Coral. Nicholls said: “At Haydock (following Betfair Chase) I got in the car with Harry Cobden afterwards and said ‘you have got a headache now’ as Politologue had just won at Ascot and I said ‘what you are going ride?’. “He said ‘I’ve not got a headache, there is only one I’m going to ride’. He has a lot of faith in the horse. He thought he ran really well the other day and it made a man of him. He went on: “Ten King George wins is amazing. For my landlord (Paul Barber), Ged (Mason) and Sir Alex Ferguson it doesn’t get any better. It is absolutely awesome. “It was a very good run at Haydock for the stage of his career and he sort of got forgotten. Some said he was not good enough, but horses progress. He was like a footballer coming from the Championship going into the Premiership that day. Cobden said: “It’s absolutely brilliant. He has improved a lot for his last run and he has done it really well in the end. “I definitely thought he would improve. He is very lazy at home and didn’t do much from the last. I was struggling to keep up most of the way, but his jumping put him in there. Tizzard was delighted with Thistlecrack and said: “He is 10 coming on 11 and it was lovely for him to come back. We thought he was (back), but no one knows. 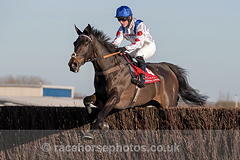 “I expect Native River will go to Newbury where he went last season, then on to Cheltenham. Thistlecrack, I’m not really sure.